than 3,800 part-time and seasonal jobs in the Chicago area to prepare for the upcoming holiday season. To help fill the positions, the company is partnering with the City Colleges of Chicago to host three hiring fairs, one on the Southwest Side. • Richard J. Daley College, 7500 S. Pulaski, from 9 a.m. to 1 p.m. Tuesday, November 22. The third was held Friday, November 18 at Olive-Harvey College on the South Side. UPS is planning to hire more than 3,200 part-time and seasonal positions at locations in Chicago, Palatine, Northbrook, Franklin Park, Bedford Park and Addison. The company is hiring an additional 600 permanent positions at the company’s regional facility in Hodgkins. The openings are for delivery drivers, as well as entry-level package handlers and driver helpers. Many seasonal employees will have the opportunity for advancements into permanent positions following the holiday season. Pre-registration for the hiring fairs is not necessary. Candidates are required to bring two forms of identification. The most common forms are a driver’s license or state ID and a birth certificate or social security card. Forms of ID must be originals (no copies) and cannot be expired. Passports will also be accepted, and free parking is available at all locations. The Chicago Cook Workforce Partnership will also be on site to offer additional employment services to job seekers. 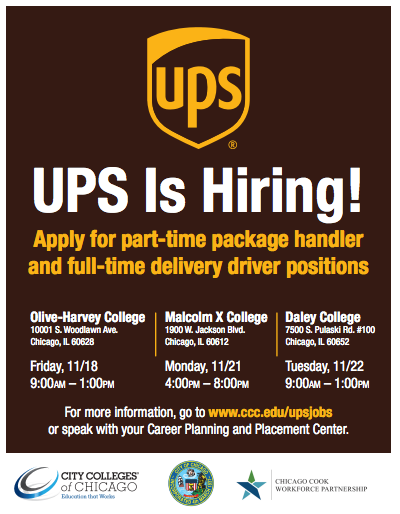 For more information, visit ccc.edu/upsjobs.